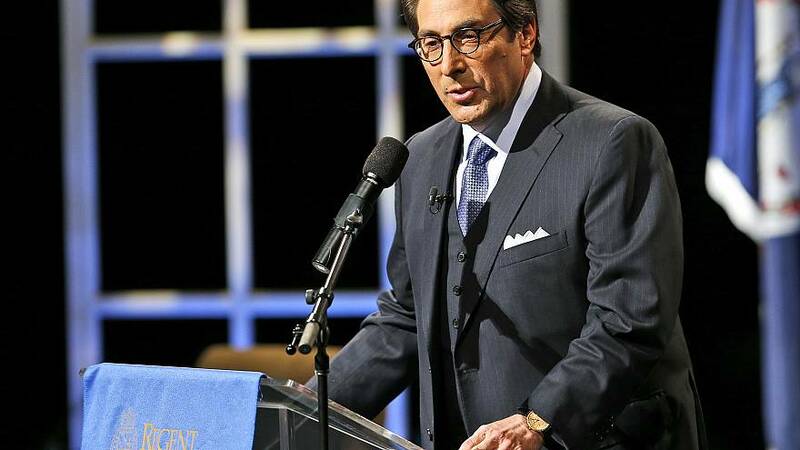 President Donald Trump's attorney Jay Sekulow on Sunday accused Democrats of using the IRS as a "political weapon" to obtain the president's tax returns and promised to fight the move if necessary. In an interview on ABC's "This Week," Sekulow said a request for Trump's tax returns announced by the chairman of the House Ways and Means Committee last week could set a precedent whereby Republicans began demanding the tax returns of top Democrats. "What is the legitimate legislative purpose?" Sekulow said of the request, which committee Chairman Richard Neal, D-Mass., made Wednesday. He added, "So this idea that you're using a hearing, a Ways and Means hearing, about IRS enforcement as a way to get to the president's private individual and business tax returns makes no sense both constitutionally and statutorily. And, look, I think this is going to be — if necessary, we're not at that point yet — if it has to be litigated, it will be litigated." Asked if the president will order the IRS commissioner, Charles Rettig, not to turn over the information, Sekulow said Trump "isn't ordering anything." Neal requested six years of Trump's personal and business tax filings under a statutethat allows him to demand an individual's tax returns. If the Treasury Department denies his request, Democrats will then be faced with whether to take legal action. If obtained, they would not simply be made public. Rather, Neal would have to designate panel members to read the returns and they would then have to vote on making the returns public. Responding to the news, Trump told reporters he was "under audit" and would not be releasing the returns. Trump has been saying he is under audit since the 2016 election cycle and has been using that explanation as his rationale for not releasing his returns. Although the IRS has regularly audited presidents and vice presidents since the 1970s, being under audit does not preclude Trump from making his tax information public, nor did it stop past presidents from doing so. Last month, Treasury Secretary Steve Mnuchin said at a Ways and Means hearing that he would protect Trump's privacy if a request like Neal's were made. "I have discussed with the legal department in the Treasury that we will most likely receive this request," he said. "As I have said, based upon the request we'll examine it and we will follow the law. And we will protect the president as we would protect any individual taxpayer under their rights." Speaking on the same program Sunday, Michigan Rep. Dan Kildee, a Democratic member of the Ways and Means Committee, said the request was made "mainly because previous presidents in the last half century have released their tax returns and it would be easy for not just Congress but any member of the public to take a look at that and make determinations as to whether or not the tax laws of the United States are being properly administered and properly applied to the president." "In this case, and particularly in this case, where you have a president that not only has very significant wealth, but made the unusual decision to continue to control that wealth and not to have a blind trust but to actually pass on to his family with his full involvement with his full involvement the ability to control his wealth, there's a real question ... as to whether the president's personal financial interests impact his public decision-making," Kildee added. "The public has a right to know whether their president's interests are impacting the decisions that he makes using the authority that we have granted him by electing him as president." On "Fox News Sunday," Rep. Ben Ray Luján, D-N.M., said the request "is not political, as our Republican colleagues are making it out to be." "No other president in modern time has had to have their tax returns requested under 6103, because they've all voluntarily shared them," Luján, the assistant speaker of the House, added. Sen. Mitt Romney, R-Utah, told NBC's "Meet the Press" that he'd "like the president to follow through and show his tax returns," which Romney noted that Trump promised in 2016 that he would do. "So I wish he'd do that," Romney, the 2012 GOP presidential nominee, said. He added that he thought the Democrats's decision to seek Trump's "tax returns through a legislative action is moronic." "That's not going to happen," Romney continued. "The courts won't say that you can compel a person running for office to release their tax returns. So he's going to win this victory." On "Fox News Sunday," acting White House chief of staff Mick Mulvaney seemed certain that Democrats would not be able to obtain the returns, adding that Democrats should "never" be able to. "Keep in mind, that was an issue that was already litigated during the election," he said. "Voters knew the president could have given his tax returns, they knew he didn't, and they elected him anyway, which is of course what drives the Democrats crazy."